With pocket queens @JonathanLittle tries to trap @CMONEYMAKER, but things go a little differently. In a $1K event in New Jersey, @JonathanLittle picks up a big hand and tries to trap @CMONEYMAKER. This week's hand comes from a $1,000 buy-in event in New Jersey. 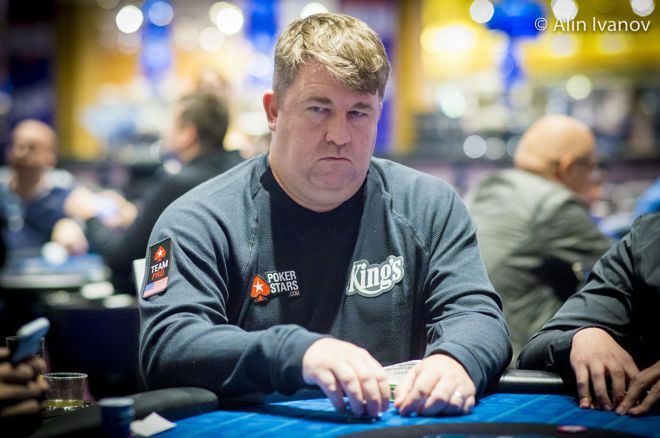 Like in last week's hand, I pick up pocket queens, and this time find myself up against a couple of opponents, including a familiar one — Chris Moneymaker. In my experience playing with Chris, he's shown he can splash around sometimes, but if he thinks you're a tight player, he can make some really big folds. Basically, he's a very good, exploitative player. At the time this hand occurred, I had gone through a dry stretch of hands and had been playing pretty tight, having a stack of about 11,000. The blinds were 150/300 with a 50 ante, and the table was five-handed. With about 20,000 to start the hand Chris opened to 800 from under the gun. Next to act in the cutoff, I looked down at . While three-betting with queens would obviously be great here, I chose just to call, thinking both that Chris would fold to a three-bet and that by calling I might induce one of the other opponents to squeeze. So I called, and indeed the small blind reraised to 3,200. The big blind folded, and Chris got out of the way as well. Unlike Chris, the small blind who had been playing a tight-aggressive style was previously unknown to me. I only had a little over 10,000 behind, so this was a spot where I definitely needed to think about reraising all in. Sometimes you run queens into aces or kings, or kings into aces. As I say in the video, don't think your job in tournaments is to sidestep what are essentially "set up" scenarios. When this happens, don't beat yourself up and think you've made some drastic mistake. That's just going to happen sometimes in tournaments, and you can't let it discourage you.